As an international energy provider, ENGIE structures its activities around the three key sectors of electricity, natural gas, and energy services. With 150,000 employees in more than 70 countries around the world, ENGIE, known also as the Group, provides its customers with high-technology solutions in response to their needs to meet the energy challenges of tomorrow. ENGIE is committed to responsible growth of its businesses in response to the central challenges of the transition toward a low-carbon economy, including providing access to sustainably-generated energy, combating and reducing the effects of climate change, and making responsible use of natural resources. Since the Industrial Revolution, energy companies have continuously evolved in response to new opportunities, challenges, and questions, such as: "how can we take advantage of renewable-energy sources and provide sustainable-energy options to customers?" Many energy providers are looking to technology and digitalization to drive insights into energy use and to provide consumers and companies around the world with continuously optimized renewable-energy options. As a leading global provider of power and energy-efficient services, ENGIE's mission is to not only provide power through low-carbon, renewable resources but also to be a leading innovator in the space through technology. “From utility and energy services to production to distribution to sales, we focus on the big picture and strive to be a leader in the energy-decarbonization transition,” says Thierry Langer, chief information officer of the finance division at ENGIE. Measuring business performance became a top priority—and challenge—for the finance division, particularly given the variable cost of utilities. By developing a new solution that integrates with local ERP systems and transforms localized data into a standardized central business framework in the same instance, ENGIE hoped to provide more precise data measurement and analysis for both local and central users. “We sought to transform our financial processes through the CFP and we believed that the tools that would enable this transformation begin with SAP—specifically SAP HANA,” explains Thierry Langer. Because of SAP’s position as a leader in the ERP market and broad adoption by enterprises worldwide, ENGIE chose to use SAP tooling widely throughout the Group. For the finance team, SAP was a critical component in successfully transforming its processes and fulfilling the mission of the CFP. The finance team first chose to run its SAP Business Suite on HANA implementation on premises. However, as the team began to evaluate its long-term approach and goals—which included an upgrade to SAP S/4HANA— it began to re-evaluate its hosting situation. ENGIE had already engaged with AWS as it underwent a broader organizational digital transformation. The finance team felt that, given the company’s experience as well as the proven AWS technical capabilities for running large-scale SAP workloads, AWS would be an excellent partner to host the development environment for the CFP. Thierry Langer and his team engaged AWS Professional Services and began building a business case for migrating the CFP’s development environment to AWS. At the core of ENGIE’s SAP deployment on AWS is the Amazon Elastic Compute Cloud (Amazon EC2) X1e instance, which is designed for running high-performance databases and in-memory workloads like SAP HANA. X1e instances are powered by four Intel Xeon E7 8880 v3 processors, offering up to 128 vCPUs and 3,904 GiB of DRAM-based memory. The AWS Professional Services team worked with ENGIE to automate a lot of the SAP environment, including the SAP database, by using AWS CloudFormation. Currently, ENGIE is running several SAP solutions on AWS, including SAP S/4HANA, SAP S/4HANA solution for Central Finance, SAP Fiori User Experience (UX), SAP Adobe Document Services (ADS), and SAP Content Server. For the ENGIE finance team, being able to reduce the expected delivery time of its new business framework by two times while upgrading its SAP platform to SAP S/4HANA was immensely beneficial for driving new business outcomes and opportunities. "Deciding to migrate our SAP footprint to AWS while developing our new business framework and analytics system proved to be an excellent choice for us," says Thierry Langer. “We were able to reduce the footprint of our database substantially: on premises, our SAP database was 4 TB on the primary database and 4 TB on the secondary database. By moving to AWS, we right-sized our database. We reduced the size of the primary database from 4 TB to 2 TB and reduced the secondary database from 4 TB to around 200 GB.” ENGIE has not only saved costs by reducing the size of its HANA databases, the company also achieved cost savings by avoiding the need to procure on-premises hardware on an ongoing basis. ENGIE continues to engage with AWS to optimize its environment and introduce innovation to its platform. For example, the AWS Professional Services team is currently working with ENGIE to build a custom auto-scaling solution for the SAP application using AWS Lambda, Amazon Athena, and Amazon DynamoDB. "Currently, our team is the only team within ENGIE running S/4HANA. As the first company use case for running S/4HANA on AWS, we've demonstrated what's possible," says Thierry Langer. "As we continue to focus on digitalization and driving insights through data, we feel it is an enormous advantage to be running S/4HANA on AWS." 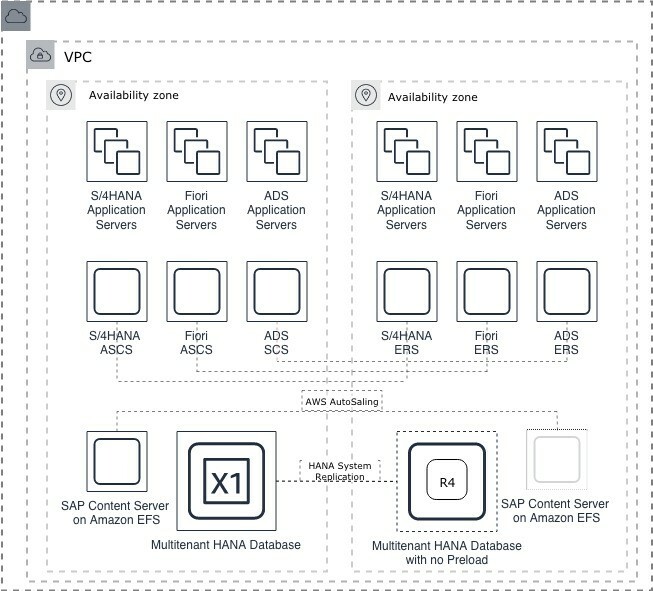 Learn more about running SAP S/4HANA on AWS.